In February of 1960, a wrecking ball painted like a baseball ploughed into a dugout in Ebbets Field, the home of the Brooklyn Dodgers beginning the demolition of a part of the borough that would leave a void in the hearts of its people to this day. Think of your favourite town; maybe, if you’re lucky, it’s where you live. Picture the restaurant where you order without looking at the menu and feel like you’re in your own living room. Picture the grocery store where you run into people you know and familiar strangers whose faces you recognize. Picture the shop that knows what you order and how you like it done. Picture those two streets that meet at that one corner that makes you smile every time you walk past it. Think of the convenience store or bodega that you never really shop at but you’re happy to know is there and open late when you forgot you didn’t have anything in the fridge for tomorrow’s breakfast. Think of the place you want to see first when you get back from being out of town. Now picture all of that taken away at once. In a weekend. Not slowly, like the encroaching spread of gentrification or even in the pleasant morphing of summer into autumn, but in one, immediate, concrete crushing demolition. This is about more than just Baseball, but about a neighbourhood being left with a giant hole where a vital part of the community once stood and because of nothing more, no other reason, than someone deciding there was more money to be made by moving the team elsewhere. We tend to see sports today with more cynical eyes than in the past. Professional sport has, through many recent struggles and public embarrassments, left an image that inspires very little adulation and leaves a bitter taste in the mouth of even its most ardent admirers. The steroid scandals of the past ten to fifteen years marked the fall of what were some of my first sports heroes as a child. But there was a time when these sports and their teams and their players meant more to their communities in eras when less distractions and pastimes gave sport a more important place in daily life. Sports teams have the ability of becoming inextricably linked to the cities they play for, until they become as much a part of every fan’s home as their own living room. Such is the case with Los Angeles’ Lakers, Toronto’s Maple Leafs, Green Bay’s Packers, and indeed even to this day with Brooklyn’s Dodgers. It’s oddly fitting that the anniversary of the demolition falls on the eve of the stirrings and small chatter of news stories that lead to Spring Training where we remember last year’s players and their successes, welcome new faces, argue incessantly about the ones sent away and the ones not sent away, and where for a short while every team has a chance, no matter how implausible, of being crowned champions. 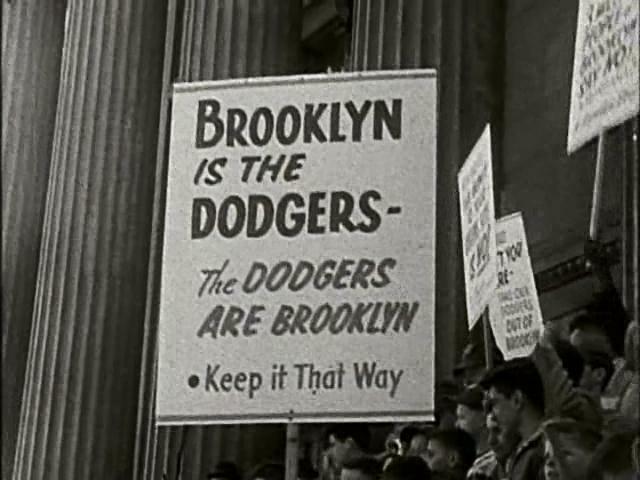 The segment I’ve linked to below from Rick Burns’ documentary “Baseball” explains the weight of the Dodgers leaving Brooklyn beautifully and better than I could ever hope to. If you like sports, and I would argue that especially if you don’t, it’s worth watching this short clip. For those of us who love Baseball and get a rush each April when we see our team in uniform again, it’s a film clip that speaks to an emotional connection many of us have with the game because of what it represents in our lives very often from its first impressions upon us in childhood. Fans from any city and fans of any sport find something to relate to with the story of the Dodgers and how a piece of land that was once a garbage dump called ‘Pigtown’ helped make a borough one of the most recognised places in the world. The Dodgers not only gave the game of Baseball memorable moments that echo to this day, but they also contributed a significant chapter to the story of the United States in the 20th Century thanks to a man who dared to bend the rules by hiring another man to wear the number 42. You can see the video I mentioned, HERE.